Both my Advanced Composition and First-Year Writing students need to produce better proposals to guide their research over the course of the semester. To that end, I designed a scaffolding activity using the television show Dragon’s Den as a framework for pitching research ideas and used live audience polling as a simple peer-review mechanism to decide which students moved to “The Library” to conduct their research. If you aren’t familiar with the BBC show Dragon’s Den, it is a reality tv show in which “Budding entrepreneurs get three minutes to pitch their business ideas to five multi-millionaires willing to invest their own cash”. Based on the success of their pitch, winners move to “The Boardroom” to negotiate business plans and investment terms. Since few students were familiar with the concept of an elevator pitch or the Dragon’s Den show, we watched a two-minute YouTube clip at the beginning of class that provides a synopsis of both the show and the elevator pitch genre, highlighting the importance of marketing your ideas precisely and concisely. Prior to class, students had been given a guide basic guide for producing a research proposal according to project guidelines and asked to bring a draft of their proposal to class for peer review. When they arrived the next day, about half of them had drafts. Have you ever wondered how to facilitate a peer review when the students have no products for review? Have them create micro-products like the elevator pitch on the fly. Using their proposals, students were given ten minutes to excerpt and create a convincing two minute proposal for their research project that they would deliver to the class and have “peer reviewed” through live audience polling, which I had previously set up on Poll Everywhere. Students who had completed the pre-assignment were, of course, better equipped to compose their pitch, but all students in attendance were required to pitch their ideas, despite being ill-prepared. While I’m not a fan of on-demand writing as a summative assessment tool, this high-pressure rhetorical situation kick-started the thinking and composition processes of those students who were waffling and forced them to move beyond the chaos of topic selection and make some decisions, even though I stress that those ideas will naturally change and evolve. Students were reminded that thoughtful and engaged participation in this activity constituted a “good grade”, not quality of the pitch. After 10 minutes, students were called up to the front of the class in groups of five and each given two minutes to pitch their ideas. Some were nervous, some were confident, some had fleshed-out their ideas, others were floundering; however, all students in attendance pitched something and listened intently to their classmates as they shared ideas and attempted to persuade the audience that their research projects were worthy of a time investment. 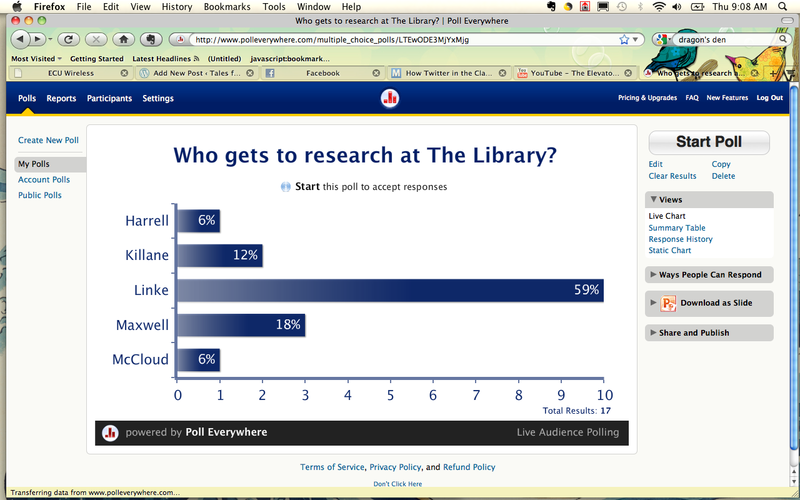 Using their mobile phones or computers, students in the audience texted or clicked the corresponding link on the Poll Everywhere site to vote their choice of best research project idea while the results showed immediately in the form of a bar graph chart that I was showed on the classroom projection screen. While I prefer collaborative as opposed to competitive academic situations and with resist the urge to “rank, evalute and like” in my writing response practices (Elbow 1993), the students, who largely appreciate the combative nature of reality-tv, were engaged by the simulation and quite comfortable judging and being judged. Using the Dragon’s Den criteria for what makes a successful proposal, the student selections were in complete agreement with my own, which I, for the sake of a true peer-review, did not disclose. This student-centered evaluation both normed our research-learning community and provided many solid examples of acceptable research projects for students struggling with idea generation. For me, this informal assessment in the first stages of the research process made plain which students I should to follow more closely and which were ready to begin work with sources. For the students, this mulit-sensory activity incorporating new and new new media (Levinson) allows those students who struggle to express ideas clearly in writing to use spoken word to captivate an audience and get immediate feedback on the quality of their ideas, not the surface features of their texts. In Talking, Sketching, Moving, Patricia Dunn, in her defense of why multimodal and multisensory work in the composition classroom is necessary, quotes Gerald Washington’s (1996) assertion that “composition teachers can use this alternative manner of communication as a starting point for the teaching of writing skills” (18). Too few composition teachers, she argues, use multisensory approaches to teaching writing, and because students will preference some learning styles over other, multimedia/multisensory approaches to writing have the potential to make the written product more accessible and attainable for more students. At the end of the class episode, all students were assigned to revise their research proposals for clarity, concision, and voice to engage their audience and “sell” their ideas. The next drafts of the proposals were, as a whole, more fiercely written and showed an evolution of both thinking about the research project and persuasive writing skills. And instead of being escorted out of the academic building, they were all (eventually) given access to “The Library”. Dunn, P. 2001. Talking Sketching Moving. Portsmouth, NH: Heinemann. Elbow, P. 1993.”Ranking, Evaluating, and Liking: Sorting Out Three Forms of Judgement.” College English 55 (2) (February): 187-206. Levinson, P. 2009. New New Media. Boston: Allyn & Bacon. Tags: Digital Learning, Research Writing | Permalink. I found your site through the NCETA booklet, and I love this activity. Can you tell me more about the poll? How did you set it up? Was it just based on the elements of their research proposal? I’d love to use this concept with my high school sophomores this week, if that’s okay with you.